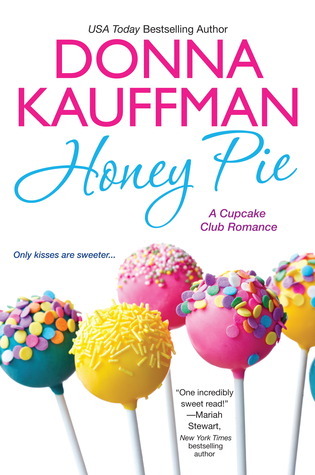 It has been about a year since I've read the first book in the Cupcake Club serie by Donna Kauffman. (Click here for the review of Sugar Rush.) I was going through a Foodie Romance fase and her and Louisa Edwards' books were definitely my favorites. Honey Pie was released TODAY and I'm very happy I once again get the chance to go back to Sugarberry Island to get reunited with Miss Alva, all our other favorite characters and to get to know one very lovely (read gorgeous) Dylan and one mysterious Honey. Soon enough, Honey is another important ingredient in the spicy mix of the Cupcake Club. But will Dylan convince her that what she craves most is his love? Honey has packed up her old life into her Beetle and rode halfway across the country to start over on the island that her dear aunt Bea loved so much. Only to arrive and find out the shop her aunt left her is now leased to Lani for her Babycakes shop. There is no going back, partly because her car broke down, but also because she made this terrifying decision and she just can't go back. Luckily Dylan, the mechanic, is here to the rescue. It's just, he's not the knight in shining armor type, nor does he ever want to be. He would rather stay away as far as possible from Honey, but he's a fixer and he's into that island mentality of helping even if you didn't ask. Dylan was the first person she met on the island and after discovering her "gift", he didn't freak out one her. Which naturally made her freak out a bit. "Sugar, we all have a little bit of crazy in us. It's what keeps it interesting." Now Honey's "gift" is something special and the reason why she has lived such a lonely and secluded life so far. It was not because she wanted to, but it was out of necessity she had to stay away from people physically, which of course also created emotional distance. Being confronted with Dylan was not what she expected at all. The way he accepts her, which she knows is not easy at all, makes her yearn for that closeness and it looks like she might get it as well. "What was it about her that made him want to move mountains, slay dragons, he couldn't rightly have said"
Dylan on the other hand chooses to stay away from people, simple because he wants to. He has had a very difficult family situation, which is now all in the past, but not something a little town like Sugarberry Island could forget. Everything has been very eventful and now he just want peace and quiet, no more drama. So for the life of him he can't figure out why he keeps thinking of Honey, when she screams drama (even if it's unintentionally). Surprisingly way less food and cupcakes involved in this book compared to the others. Honey is absolutely no baker and just participates in the Cupcake Club as a taster. Also the paranormal theme was a major surprise to me, but definitely made it very interesting setting up roadblocks between Honey and Dylan you would never expect. "We Southerners deal with this ungodly heat by being unbearably civilized." I love it that all the characters from the previous books make a cameo appearance. Miss Alva is still my favorite character, she's amazing and I adore how she keeps everyone on their toes around her. So Honey Pie has plenty of humor, lots of drama of course, some delicious cupcakes, a bit of the occult and a smoking hot man, everything a woman could ever want! There are plenty of Foodie Romances out there these days, but which one is your favorite ?